(L-R) Rachel Cantor, Megan Tusing, Annie McGovern, DeWanda Wise. Image by Richard Berube. Theatre out of gentle events in a religious community. In the hands of playwright Arlene Hutton, personal and community decision points become not The Crucible with vengeance and debate and recrimination, but a story of a community reaching its arms around its members to provide a place to heal and grow and practice beliefs and a simple life. ’tis a gift to be simple. This 10th anniversary 3Graces production is quite simply glorious. A human delight. 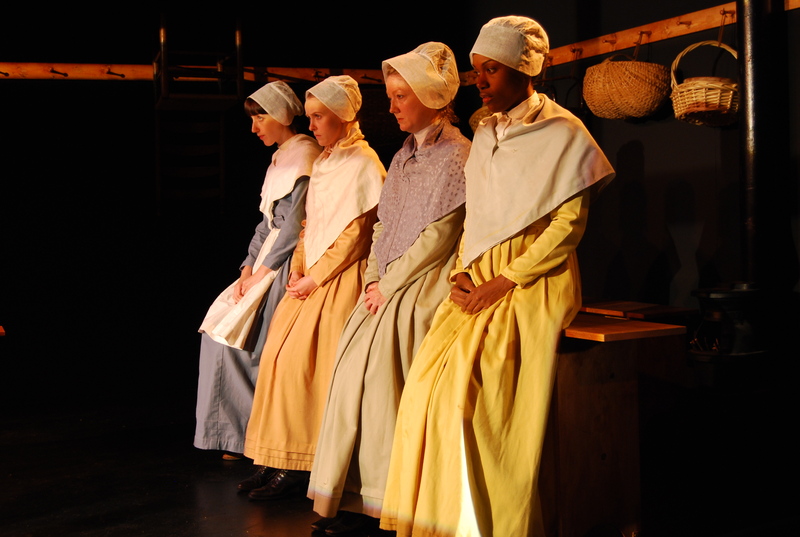 In 1838 a Shaker community in Kentucky absorbs several young women who have various needs and past life experiences. Izzy (Rachel Cantor) was placed with the community by her father when her mother died some 15 years before — we used to call these children “half ophans” in the United States. She has known no other life than the celibate, cloistered, simple world of the Shaker sisters and brothers. Fanny (Megan Tusing) seeks protection from preying male relatives. Polly (DeWanda Wise) seeks a new life after spending her youth in a brothel. And older characters have found solace and community in this celibate world also. Phebe (Kathleen Bishop) had been a minister’s wife and came to the community with her husband, both embracing their roles in the separated male and female portions of the compound. Jane (Annie McGovern) also came with her husband, seeking solace and sustenance after their farm failed and their five children died in childhood of disease and poverty. Jane’s story as she finally shares it (quietly to a few sisters) rips your heart out. This is a story of survival in a cold cruel world, a story of spiritual faith despite all odds, a story of a community seeking to keep an even keel. Set designer Joshua Wunderlich positions us as participants in and observers of a Kentucky communal world of almost 200 years ago, sporting an appealing spare aesthetic. A Shaker room I’d love to move into in a heartbeat: three walls of proscenium set limned with peg boards about six feet off the ground on which are hung clothing, baskets, brooms, chairs. In the Shaker way — there is a place for everything up, away, simple. Tables as desks, stools, benches, as required by the task of the moment. Workbench and Thos. Moser continue this design style into the 21st century that began in a separatist yet inclusive communal religion imported to America in the 1700s soon after its persecuted beginnings in England. Shaking as an illustration of feeling the spirit became dance movements. Direction by Ludovica Villar-Hauser and musical direction by Phillip Bettencourt create this world — the women sing in unison, sometimes in “rounds” as they transition from scene to scene or while they engage in daily work or as a spontaneous outpouring of spiritual joy. Actions are fluid and pared. Glorious costumes by Shelly Norton and Veneda Truesdale charm with their beauty and function. ’tis a gift, this production.